Kerala Parotta / Malabar Parotta is a layered flat bread of Southern India, particularly in Kerala. 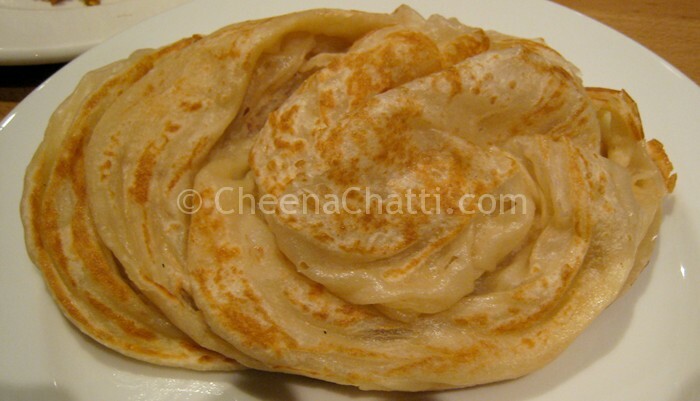 It is similar to north India’s Laccha Paratha. The only difference with the North Indian variant is that Kerala Parottaa is made of Maida (All purpose flour) and requires good kneading to prepare a very soft dough. Parotta can be served as a main dish with any meat or vegetable dish. There are two variants for Kerala Parotta, Rich and light. Here is the recipe for the rich one. For vegetarians, you can skip milk and egg and can prepare the light variant. In a medium sized bowl, mix together the flour, egg, sugar, curd and milk to make a loose dough similar to that of chappathy. Pound and knead the dough for several minutes till it becomes soft and smooth. Cover with dough with a wet cloth and leave it aside untouched for 4 – 5 hours. Knead the dough again before making the parotta. Roll out lime sized balls from the dough. Again roll each of them into round and thin on a floured stone or board. Spread some warm ghee or fat on it and pleat each balls lengthwise from one end to the other and twist into a round. Flatten these twisted balls again with the palm and fingers of your hand or roll it softly without applying pressure. Cook them on a hot, greased iron pan by flipping in between till both sides are well done. Now, keep three or four parotta on top of each other and forcefully compress them between your palms. This will make it soft and separate the layers. Serve parotta hot with Chicken Korma, Mutton Curry, or Beef roast. Keep the dough, balls, and the parottas covered with a wet cloth when ever they are idle. Learning how to make parotta without a demonstration is just like learning swimming via postal course. You need to see how parottas are made at least once to understand the steps. I searched a lot for a good video in the web and this is the closest I could find. If time allows, I will shoot a video myself and post here. If you want to see one more video, check out this parotta making video too. This entry was added on June 14th, 2013 by Cini P Moideen in Non Veg and tagged with kerala parotta making video, kerala breakfast, kerala parotta recipe, parotta recipe video, malabar parotta, parotta recipe, parotta video, best parotta recipe, easy parotta recipe. Last revised on April 4th, 2018. @SJ: Superb! Would love to see that. Please share it here in CheenaChatti or in myownfoodcourt.blogspot.com / FB. Thank you for sharing this recipe,Dr.Cini Moideen.